The story that Mainara, above, did not know, was one of violent homicides for land in the 1980s, as detailed in the film of Adrian Cowell and Vicente Rio, Killing for Land. The brutal killing of the landless leader Sebastião Pereira and his grandson Clésio that took place in 1986 by a gunman hired by the rancher Jaquim Branco and his brother, José Branco, remains unpunished. Although Killing for Land was created in 1989, the Brazilian version did not come out until 2012 and was shown for the first time in the Amazon last week. A mirror is a metaphor. Through a mirror, we might think we are seeing things as they are, but in fact, mirrors are only distortions of reality. I thought of this metaphor when I was invited by Evandro Medeiro professor at the Federal University of South and Southeast of Pará (Unifesspa), to be the curator of the first documentary film festival to be organized in the violent countryside of the state of Pará. Evandro suggested we call the festival: The Amazonian International Frontier Film Festival (FIA-Cinefront). ‘Front’, suggests the idea of frontier, as a frontier of capitalism (viewed from the ‘centre’ of the industrial or financial world). In fact, we thought, ‘front’ should also be about frontlines and particularly the frontline of resistance. The frontier is actually the centre of global struggles over natural resources. The frontier is the boundary of otherness and, hence, the front of alternatives to capitalism and possibilities of facing the ecological tragedy of the Anthropocene. I thought that the very special audience in Pará would be interested in seeing their own experience of conflicts, through the eyes of people from distant places who made documentaries about their land. I thought this distortion of reality could help them reflect on their history. The timing of the film festival was precise. 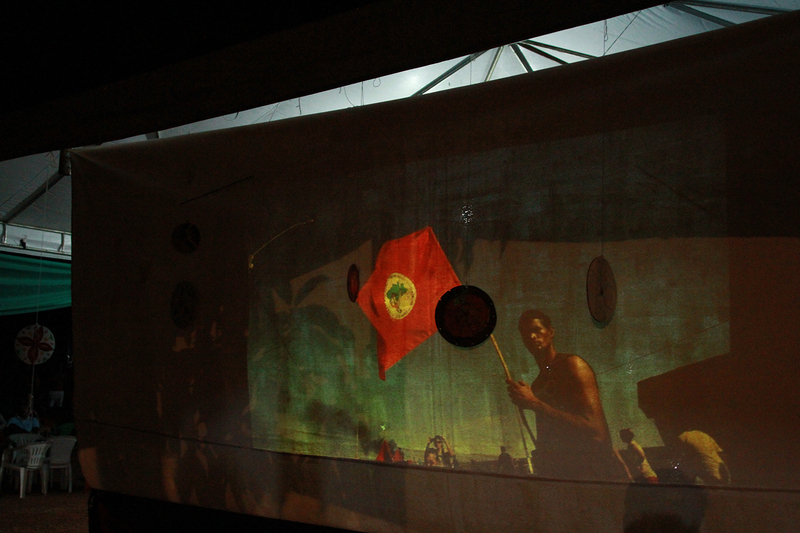 Cinefront ran during the week of mourning and mobilization that happens every year around the 17th of April (the international day for land reform). This day is in memory of the Massacre of Eldorado dos Carajás (1996) when the police killed 19 activists from the Landless Movement (MST). 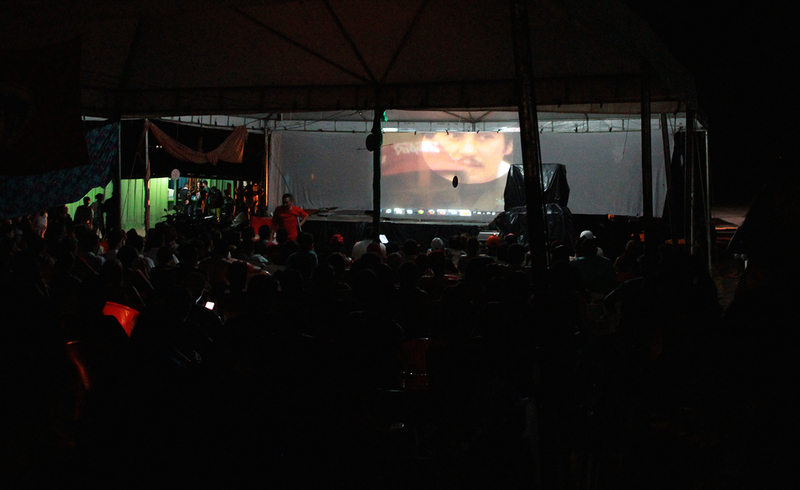 We wanted to present films to the youth of MST that had camped on the site of the massacre, right next to the PA 150 road at the “S Curve”. 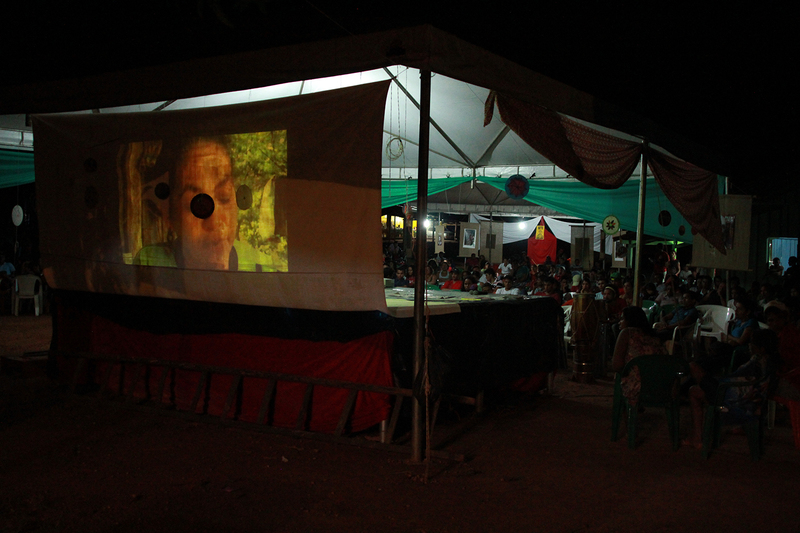 The films were screened in several places, including the old Morocco cinema in Maraba; one of the most violent sites of conflicts over land in the Amazon. In 2000, this place saw the killing of union leader José Dutra da Costa (“Dézinho”). His wife, Maria Joel, is still receiving death threats. During this week, we screened up to five films a day, always followed by a debate. When screening The Salt of the Earth at the “S Curve”, young people were fascinated by the images. They discovered the person who had photographed the massacre whose memory they were fighting to preserve. 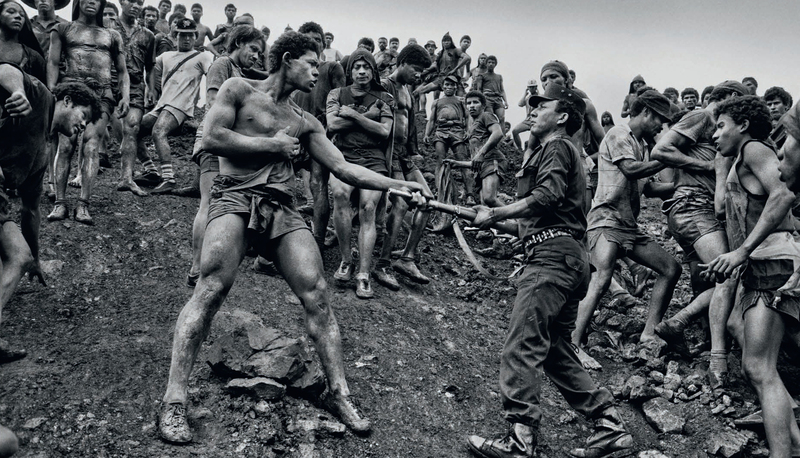 Salgado, with his astonishing pictures, made the Massacre known worldwide and engaged himself in a campaign to raise funds for the MST, together with the Brazilian singer Chico Buarque and the Portuguese writer José Saramago. From Mexico, where he was at that moment, the director and son of Salgado, Juliano sent me a message saying it was “an honour” to him that the film was shown at the S Curve: “There could not be a stronger and more symbolic place”, he said. Two of the films we showed at the festival were Toxic Amazon (now available online), and Threatened, made by Julia Mariano. People were shocked from the violence in these films, but it was the same kind of violence that they also are suffering. Toxic Amazon is a sad film Bernardo Loyola and myself made, about the killing of Zé Cláudio and Maria. They were an environmentalist and nut-collector couple, killed in 2011 by two gunmen in the settlement they lived in at New Ipixuna. The connection of these films to the killing of Dézinho -union leader and landless activist – was direct. One man from the audience commented that he was close to Dézinho the day of his killing, while another one, a young boy, said his dad was a friend of his and they now live in the settlement created after Dézinho’s struggles. Then, surprisingly, a student presented himself as the grandson of a logger, son of a large landowner (latifundiário, he said, in Portuguese). He asked about the other side of the struggles, the ranchers, and also why I was painted red. My paint was easy to explain, as I was coming from the Hawk indigenous land where I had been learning about their struggle against the mining company Vale. Explaining the “other side”, however, was more complicated. There are many sides in land struggles in the Amazon and, we could all agree, that at least Justice should be done for all. Nevertheless, the man who designed the killing of Dézinho, a rancher named Delsão, is still free today, 15 years after the crime. The honoured directors of the festival were Adrian Cowell (in memory; he died in 2011) and Vicente Rios. Mountains of Gold is a movie made by Cowell, about the extreme gold mining of Serra Pelada and the arrival of the huge multinational mining company Vale (previously known as Companhia Vale do Rio Doce – CVRD). The Hawk people are still protesting against the Vale mining company whose railway crosses the indigenous land. The day after the closing of the festival, the Indian Day for Brazil (19th of April), the Federal Court granted an injunction to send the police to expel the Indians from the border of the railway inside their land (enforced on the Indian Day!). This decision came with a strong component of racism, as the judge called the Indians “petty” for demanding their rights against the company, at the same time declaring that the role of the Judiciary is to protect capitalism practices. Vale had a hanging compensation to the Hawk people since the 1980s, due to the impact of the railway inside their territory. But with this new decision, the company argued that there were now no obligations of payment. By chance, in the audience was the judge Cesar Lins, who had signed the decision described above. He watched the film – as he was invited by coincidence and also because he would be playing drums in the show after the screening, in the same square. His friend told me that, all this time, he has been boasting about his decision on the conflict. During the screening he was asking his friend what was this “communist rhetoric” all about. The story of the Hawk people does not appear in Cowell’s film (which focused on the conflict of gold miners and the huge mining company). However, Conchita’s 10 minutes speech was very precise in explaining their side and completing the film. One could say that, at least in the mirror effect of the metaphor, it inverted positions towards the judge, who never called any indigenous leader to a hearing, nor took their arguments into consideration. Conchita asked for the recording of her speech to show it in schools of the Hawk village. The judge went to play drums with his band that performed after the festival at the local bar in the square.